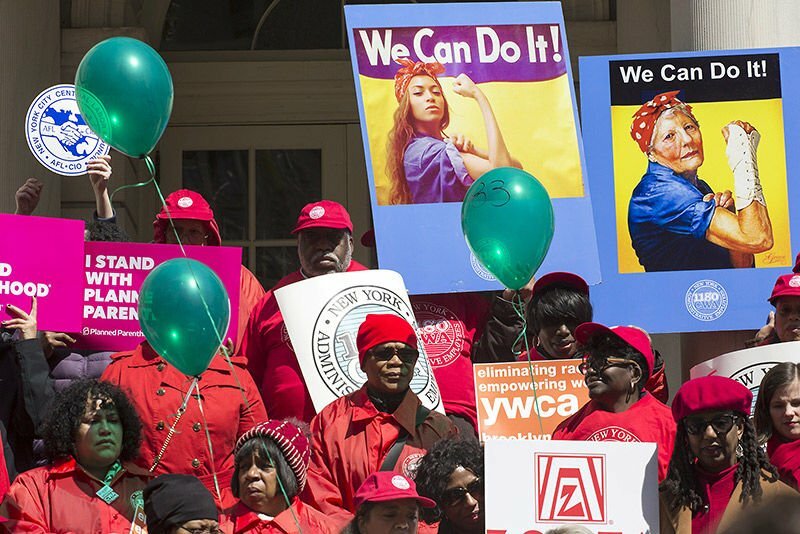 FINALLY ADDRESSING LINGERING BIAS: Veteran union members revel in their victory against city pay policies over a 40-year period that reduced salaries for Administrative Manager jobs at the same time that those holding them increasingly were women and black or Latino. The settlement provides for $5.5 million each for back pay and annuity payments and $4 million for future retroactive payments and raises. The de Blasio Administration and Communication Workers of America Local 1180 have reached a settlement to resolve a gender and racial pay-discrimination lawsuit covering Administrative Managers that was brought in 2013 against the Bloomberg administration. The $15-million accord, which still must be approved by a Federal Judge, covers 1,600 active and retired Local 1180 members who were on the job from December 2013 through 2017. The settlement is a major achievement for Local 1180, which Administrative Managers fought to join in 1976 in a bid to win collective-bargaining rights during the fiscal crisis as the city was consolidating civil-service titles. The union’s breakthrough came in April 2015 when the U.S. Equal Employment Opportunity Commission found reasonable cause to believe that for decades the city had engaged in widespread discrimination against women and people of color who held the Administrative Manager title. As part of the local’s successful brief, it documented that in 1978, when the Administrative Manager title was mostly held by white males, the job paid the equivalent of $92,000 a year, but in the years that followed, when an increasing number of women held the title, the salary dropped to $53,000. The EEOC estimated the disparity cost the women close to $250 million collectively over their careers. Under the terms of the settlement, $5.5 million will be set aside for back pay along with $5.5 million in annuity payments and an additional $4 million earmarked for retroactive payments and raises going forward. Ms. Middleton said that she was most excited about the deal’s requirement that for the next five years the covered Administrative Managers will have their compensation re-visited annually by management, with the expectation that the existing pay disparity will be reduced. The Kurland Group represented Local 1180 in the lawsuit. Rose Reeves is an Administrative Manager for the Department of Housing Preservation and Development with 36 years on the job. After the City Hall rally, she was philosophical about the settlement, calculating that over her career she had lost hundreds of thousands of dollars in potential earnings. “I want to retire in three to four years,” she said. “So, before I retire we will hopefully see a change.” She said she was consoled by the knowledge that because of the union’s legal battle, “we are paying it forward” for all the women who come after the 1,600 covered. In 2017, as the mayoral race was taking shape, the de Blasio administration and Local 1180 announced an agreement in principle, but behind the scenes negotiations continued, with a deal proving elusive amid what union sources said was “institutional resistance” from career city officials. 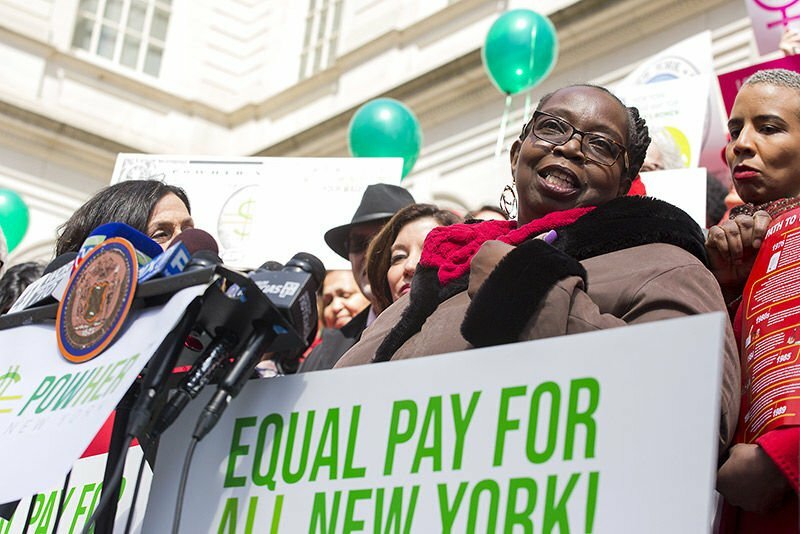 The union announcement was timed to mark the 13th annual celebration of NYC Equal Pay Day and drew Lieutenant Gov. Kathy Hochul, Attorney General Letitia James, City Council Speaker Corey Johnson and Majority Leader Laurie A. Cumbo, and the Council’s Women’s Caucus. According to the statistics supplied by the rally organizers, white women earn 81 cents on the dollar for every dollar that’s earned by white men, with African-American women taking home 65 cents, and Hispanic women just 56 cents. The rally was also a time for supporters to revel in the significant political progress recently made by women in Albany and at City Hall. “What a difference a year makes,” Ms. Cumbo told a cheering crowd. “When I look around at all of the dynamic changes with our then-Public Advocate become the New York State Attorney General [Letitia James] —when I see Crystal People-Stokes, the Majority Leader of the Assembly—when I see Andrea Stewart Cousins [Senate Majority Leader], who has broken the barriers there—we know we have three African-American women who are now majority leaders at the city and state level—positions that were previously held by white men."